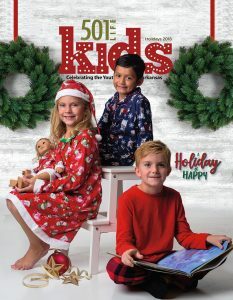 The latest edition of 501 Kids – the annual holiday issue – is hitting the streets. Dazzle Daze, which will kick off with Girls Nite Out on Thursday, Nov. 15, will continue with two days of general shopping on Friday, Nov. 16, and Saturday, Nov. 17. The event, which will be held at the Conway Expo Center and Fairgrounds, is sponsored by the Conway Regional Women’s Council. Tickets can be purchased at dazzledaze.com. “Not only are shoppers getting a jumpstart on their holiday purchases, they are also helping their community because proceeds will be used to expand 3D mammography at the Conway Regional Women’s Center,” said Sonja. 501 LIFE is a Presenting Sponsor. Another special event, planned at UCA’s Reynolds, is “Junie B in Jingle Bells Batman Smells” at 6 p.m. Tuesday, Dec. 18, with a special Christmas party after the show. The party – called “Cupcakes & Christmas Chaos” – is at 7 p.m. Those attending will enjoy cupcakes, activities and have an opportunity to have their photo taken with Junie B. (You will need a show ticket and party ticket to attend both. Also in this edition, 501 LIFE contributors Kellie Bishop, Brittany Gilbert and Meagan Lowry have some wonderful and helpful information for parents and other caregivers. 501 Kids is distributed through schools, daycare centers and businesses throughout Faulkner County. Copies are available at the 501 LIFE office at 701 Chestnut St. in Conway and at the following locations of advertising partners: Central Arkansas Pediatrics, Conway Regional Medical Center, First Security Bank, First Service Bank, Shoe Choo Train and St. Joseph School.